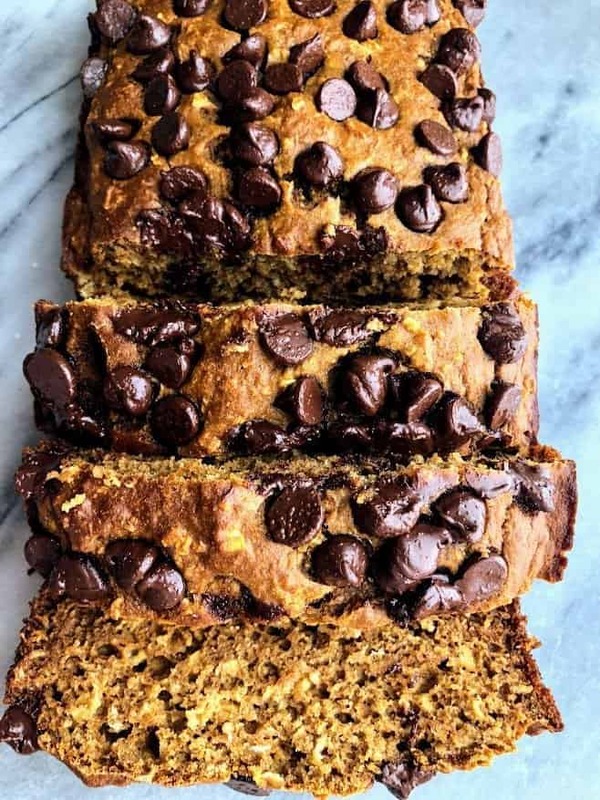 This healthy pumpkin oat bread is naturally sweetened with honey, and is made from simple ingredients like Greek yogurt and oatmeal. This bread is fluffy and moist and can easily be made gluten free. Three claps for fall because IT IS HERE!! I act like I’m super excited about it, which I am when it comes to the food and all the fall flavors, but man I am a summer loving girl for sure. Give me shorts, tank tops, open toed shoes, beach towels, and the warm sun. The summertime weather always has made me happiest, and even though this summer was one of the hottest ones on record, I still loved every single minute of it! 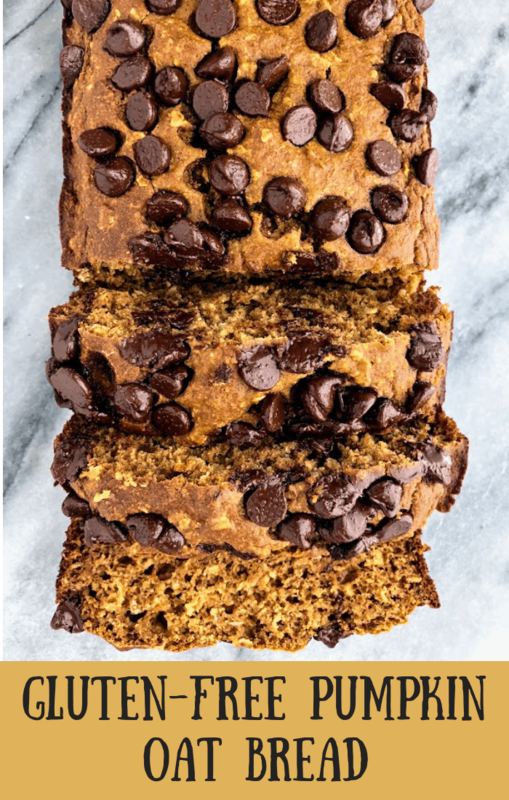 Since I already have a healthy pumpkin bread recipe on my site, I knew I wanted to create one that was a little bit different but still provided that amazing pumpkin flavor. I ran into the newly opened Sprouts market last weekend to pick up a can of pumpkin to make this bread with. Are you familiar with Sprouts market? It’s an awesome new-to-Philadelphia super market with lots of stores all throughout the United States. They focus on the idea that healthy living is a journey and every meal you make is a choice. The produce is at the center of the market, is displayed for everyone to see, and everything comes at an amazing price. I personally couldn’t get over the pineapples that were 88 cents! Everything is so reasonably priced and I can’t wait to make it my new favorite grocery store! I love the addition of oats in baking because I know it makes the bread nuttier and a little but more chewy, and while baking with whole wheat flour is delicious, it calls for lots of moisture because that flour is very “thirsty”. So if I’m forced to do fall…I want to be forced like this. 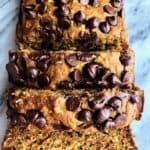 With healthy pumpkin oat bread! This healthy pumpkin oat bread is naturally sweetened with honey, and has simple ingredients like from greek yogurt and oatmeal. This bread is fluffy and moist and can easily be made gluten free. Preheat oven to 350F and prepare loaf pan with parchment paper or nonstick spray. Add pumpkin, greek yogurt, honey and vanilla and stir till combined. In a large bowl, mix together oats, oat flour, baking soda, spices, and salt. Add dry ingredients to wet and stir till combined. Stir in chocolate, saving a few chips for the top. Bake in oven for 45-50 minutes or until toothpick comes out clean. May need to cover with aluminum foil to prevent top from browning.